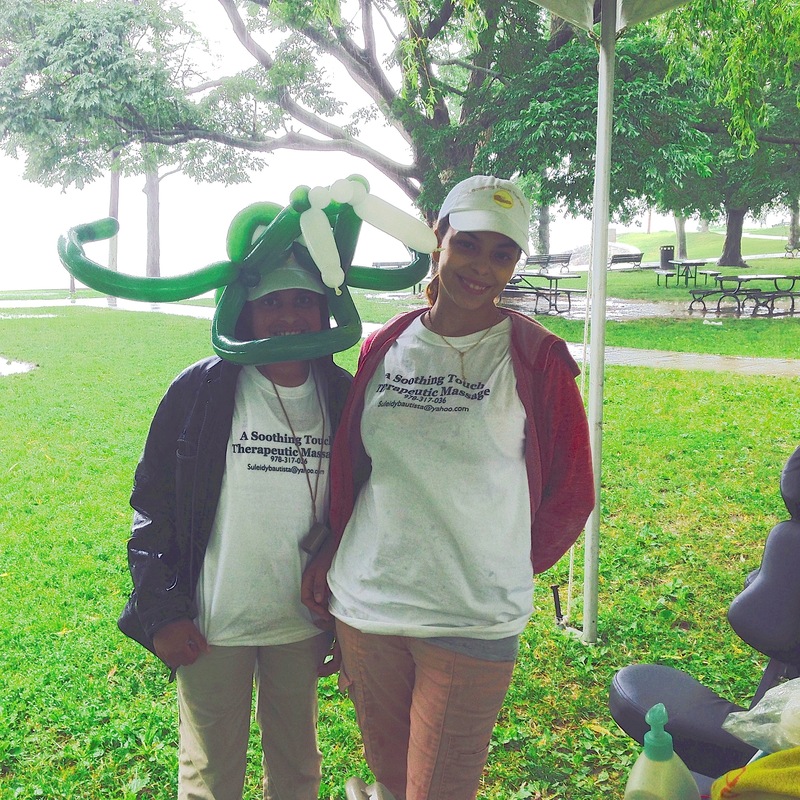 Despite Torrential Rain, NSMC Cancer Walk a Success! A Good Day for Ducks, Fund Raising and Lots of Enthusiasm! Sunday’s weather brought torrential rain, but it didn’t keep participants from walking at the 25th Anniversary North Shore Medical Center’s Cancer Walk. Over 2,000 people walked in the midst of the storm. A Wet But Enthusiastic Crowd. … but a few were caught out in the cold in just shorts and a tee-shirt. One lucky dog was able to snag a poncho and find shelter under a table. Congratulations to all the walkers! Some were walking for themselves, others in memory and in honor of loved ones. One woman told me after she, “I lost 50 pounds to get in shape for the walk,” and was “walking in memory of her father.” He must be so proud! One thing for sure …. Luck and God Were on Our Side – Early weather reports were for thunderstorms and lightning; Never a good time to be under trees! And the Salem Willows has a lot of beautiful trees! But luck was with us and despite torrential rain and high winds, no lightning! 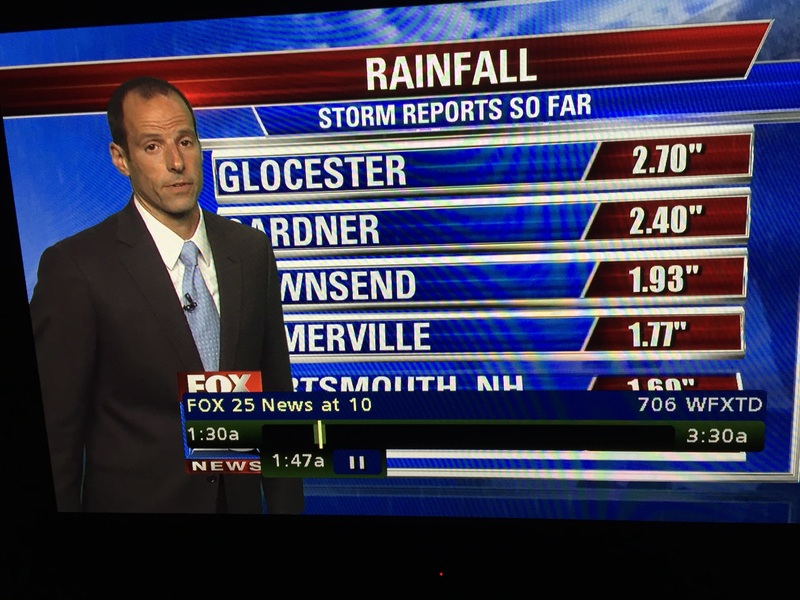 We felt ”blessed and grateful’ as a falling tree limb in Wenham narrowly missed Nancy’s car, and a car speeding through a red light in Salem narrowly missed mine! “Rain or Shine” We Were Told. So organizers, participants and volunteers came with high spirits and plenty of optimism. Despite the cold, wet weather a few people did stop by for Massage and Reiki Sessions. And oral cancer screening provided by Dr. John Fisher, DDS of Salem, MA. Suleidy Bautista; A Soothing Touch Massage Therapy. Featured in this music video are – Matt Palazola – Drums and vocals, Mark Lewis – Bass, David Rabin – Lead Guitar, Bernard Benedetto – guitar and vocals, Gary Amberik – Keyboards, Frankie Price – Lead Guitar. For those that wish to donate – https://nsmcgiving.partners.org/cancerwalkrun. Mention ‘Code Blue,’ another team, or general giving. This entry was posted in Dreamtime Wellness and tagged Cancer prevention, Cancer Screening, Cape Ann, Code Blue, Dreamtime Wellness, Emily Dickinson, Fund Raising, Gloucester, Heart, Hope, Howling wolf taqueria, integrative healthcare, Integrative Oncology, Integrative Therapies, Mass General/North Shore Cancer Center, Massage, Nancy Earabino, National Center for Complementary and Integrative Health, NSMC, NSMC Cancer Walk, NSMC Wellness and Integrative Healthcare, Oncology, Oral Cancer Screening, Reiki, Reiki Massage, Salem MA, Salem Willows, Suleidy Bautista. Bookmark the permalink. ← Wind Down Wednesdays at MAC!